Hackett et al. 's (2008) analysis of nuclear gene sequences strongly supported a sister group relationship between the Ardeidae and the clade including the Balaenicipitidae, Scopidae, and Pelecanidae. Because the stem species of the last two groups probably lived in Africa (see Sect. 7.6), the Ardeidae may also have originated on this continent. Indeed, the oldest unambiguous fossils of the Ardeidae stem from the early Oligocene Jebel Qatrani Formation of Egypt. A tarsometatarsus from this locality was assigned to the extant taxon Nycticorax (night herons) by Rasmussen et al. (1987), but the authors themselves considered the possibility that the morphology of this bone in Nycticorax may be primitive for the Ardeidae. Rasmussen et al. 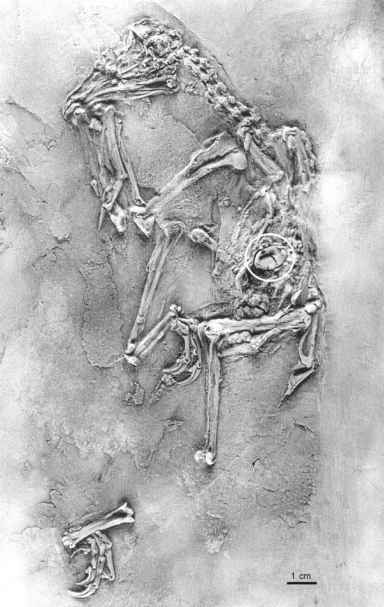 (1987) further described a second, slightly larger and also unnamed species of the Ardeidae from the Jebel Qatrani Formation, which is represented by an incomplete rostrum and a few referred bones. Another Paleogene heron, Proardea amissa, was reported by Milne-Edwards (1892) from an unknown horizon and locality of the Quercy fissure fillings. As yet undescribed remains of this species were found in the late Oligocene (MP 28) Quercy locality Pech Desse (C. Mourer-Chauvire, personal communication, and own observation). Mlikovsky and Svec (1989) further noted that "Anas" basaltica Bayer, 1883 from the "middle" Oligocene of the Czech Republic is a representative of the Ardeidae. Kurochkin (1976) mentioned the presence of as yet undescribed Ardeidae in the early Oligocene of Mongolia. Olson (1985) found the holotypic distal humerus of Gnotornis aramiellus Wetmore, 1942 from the early Oligocene (Whitneyan) of South Dakota to be very similar to that of herons. If further material confirms ardeid affinities of this species, it would constitute the earliest New World fossil record of the Ardeidae.